Since january 2018, I live and work now in Shanghai, China. Of course I had traveled to China a lot before, but now living here, makes you really experience life in China. I am really happy I got the opportunity to work here for a great company. I am learning so many new things, enjoying China and I let myself be amazed everyday by the technology and transportation advantage they have here. It is so impressive, they are way ahead of Europe and even the US. Here in China, I really experience how technology and design thinking can make life much more easier. 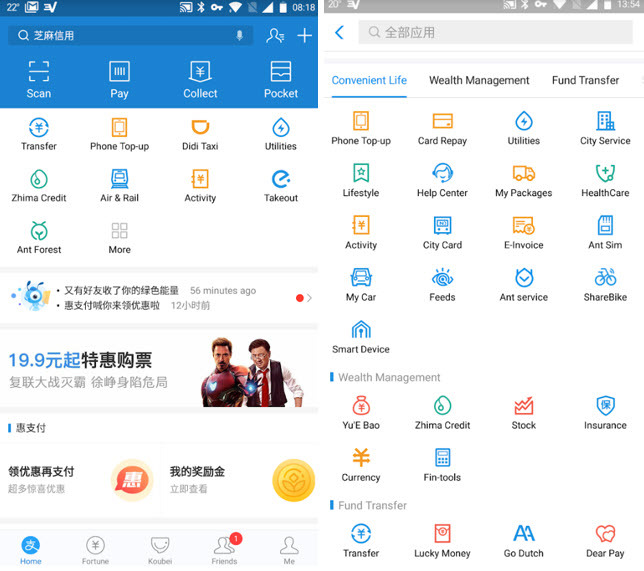 Take a look at Alipay, an app, I use almost every day and this app makes life so much more easy for me.I will explain some functions I use regularly. In the Netherlands (or Europe) we are used paying with "debit cards'' or sometimes a credit card. Here in China, I also have a debit bank card. But I used it only once and that was for connecting my bank account to Alipay. After that I never used it again. 99% of my payment transaction I do with Alipay. I press the "pay" button at the Alipay app, a QR code appears at my phone and the cashier just scans this QR code. That's it, I have paid now. A confirmation will appear at my phone. Or alternatively, if the cashier does not have a QR code scanner, I press the "scan" button in Alipay, and I scan a printed QR code. Usually every vendor has one. Alipay then asks me for the amount I want to pay, I type in the amount, press confirm and the payment is done. I show the vendor the confimation and I can walk away with my purchased goods. After payment usually a screen pops up where you can "rate" the vendor. 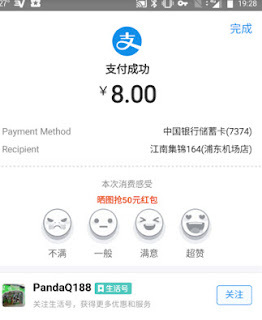 Good ratings help the vendor ranking higher in Alipay's promotional overview. A great idea, both good for vendor and buyer. I think paying with Alipay is much easier and safer then paying with a debit card. It is so convenient. I do not need extra cards in my pocket, that often get damaged in my pockets. Just my phone that I always have with me anyway. RFID copying, a scam that often happens with debit cards, is not possible with this way of payment. The QR code itself changes every 2 minutes or so, so it is also no use try to copy a QR code. Often when my bankcard is broken, I have to wait 5 days before I receive a new one and if I want to sent a new one from Netherlands to China it never arrives (believe me I tried). Here with Alipay, all you need is a working phone. As long as I have a working phone I can pay with Alipay. Yes, your phone battery can get empty, but in China you can charge your phone really everywhere. Take this "Energy Monster" a device that you can find in many restaurants. 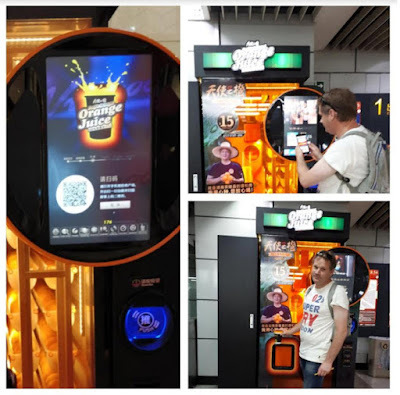 Just scan the QR code (with Alipay) a menu pops up at your phone and you can choose to charge it for 1 hour for 1 RMB, pay connect your phone and charge! You can just put this device at your table and charge it. 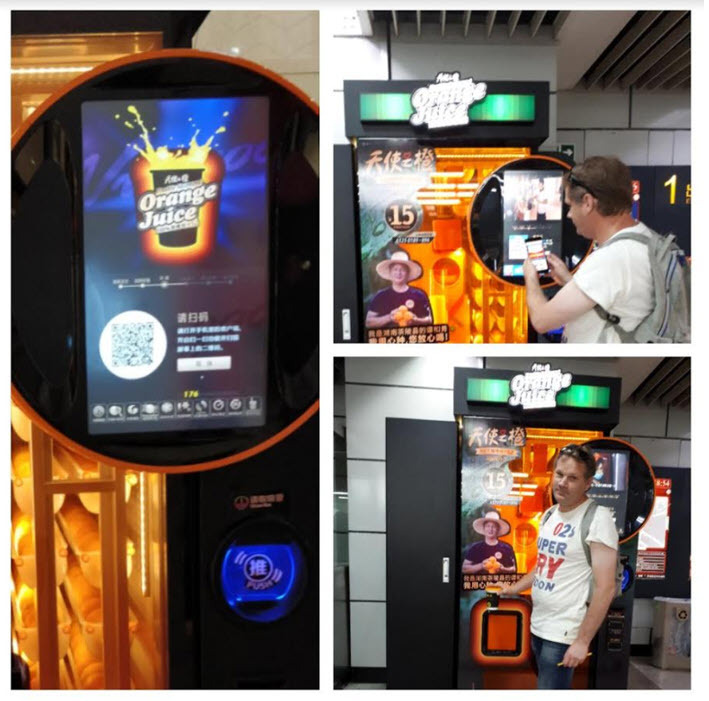 A fresh orange juice a day, paid with Alipay, keeps the doctor away! But there are also in shopping malls special machines where you can just "borrow" a powerbank. All digitally. As we all know, an orange juice a day, keeps the doctor away. 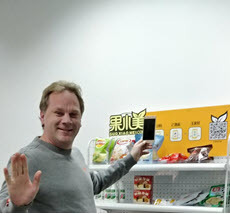 Here in China I always say: "a fresh orange juice a day, paid with Alipay, keeps the doctor away"
At the office we have a shelf where products are stalled. 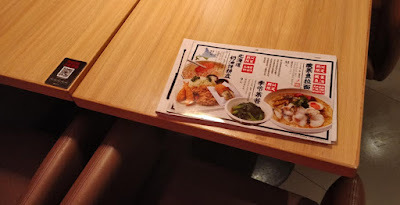 If I scan the QR code with Alipay a menu opens within Alipay with all products on the shelf. I simply select the product, buy it with 2 clicks and I have some food or drinks. Very convenient all from within the same interface. Scan a QR code and buy the product. Living here also means I have some obligations in paying bills. Pay the water bill, the electricity bill etc. Not my hobby, but here in China I still smile when a bill comes in, because I know I can use Alipay again :) . The complete bill I get often by post is totally in Chines, but there is always one number at the bill that I can read. So I go to Alipay, I press "utilities" I click on to the right supplier and I type in the bill number. As soon as I have done that, the amount I have to pay get's retrieved automatically, I only have to press "confirm" to pay. I also had a few times that I did not even have to enter the bill number , but they appear in Utilities automatically. So much easier then I was used to in the Netherlands, I always have to enter long IBAN numbers where you can make very easy mistakes in typing them, use a difficult to use "card reader", and often you also have to wait a few days untill the money is transfered. Alipay is so much easier. It is hard to believe, but suppose you do not use Alipay for paying your bills, you can also walk to the local convenience store, give them the bill and the money and they are able to pay the bill for you. And believe me here in Shanghai there is a convenience store every 100 metres. Back in the Netherlands, making an appointment with a doctor, municipality or other city services, is always a hassle. If it is possible to do it online, they all have their own website, specific login and different user interfaces, making it hard to understand and to quickly achieve your goal (making an appointment). Here in China, Alipay makes it possible to do this from one easy interface and from one place. You can arrange an appointment with the hospital, even with a specific doctor, arrange an appointment for getting your driver's license and much more. All by using Alipay's "City Service" option. In Europe, if you buy goods online, it is always a surprise, how the customer journey in informing you about the status of your delivery is arranged. Sometimes you hear nothing, mostly you have to surf to some specific website of the carrier the vendor uses, typing in difficult track and trace numbers and ussing ugly designed websites to find out where your parcel is. Here in China, as long as you buy online and pay with Alipay the track and trace information is being sent to you via Alipay. There is no email here as we have in Europe, you always know where you have to be to track your package, just go to Alipay. Oh, online payments are just as easy as offline payments, just scan a QR code. Do you know this feeling? You are in a restaurant and you try to get the attention of the waiter, to order something, or to pay..and he or she just does not respond. You keep on waving, seeking eye contact but it just is not working. 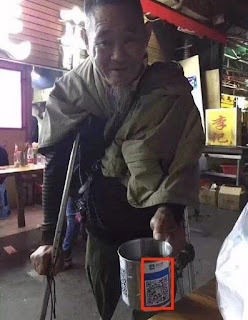 Here in China there are always more then enough waiters and usually they are more customer focused then in China, but still even when they are not, in China it is possible to order without a waiter. More and more restaurants in China, do not show you a physical menu standard, they have just placed a QR code at your table. By scanning the QR code you get to see a menu at your phone and you can order easily from this menu. With a few simple clicks you order your food and it will be delivered to you shortly. Of course the payment can also be done from Alipay so after payment you can just walk away. No need to wait for change, go to a cashier or anything like that. Great idea, very convenient and also good for the environment. I walk quite a lot here in Shanghai, there is so much to see and the climate is much better then back in the Netherlands. Also I bike a lot. Alipay detects all of this and within Alipay there is an option called "Ant Forest". Why it is called "Ant" I did not yet figured out. But fun it is, because if I click at "Ant Forest" I can see all my activities that are good for the environment like walking, biking, taking the subway, or pay withouth paper invoices. 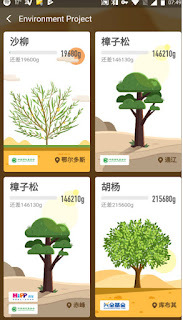 The more I do this the faster my "digital tree" is growing in Alipay. 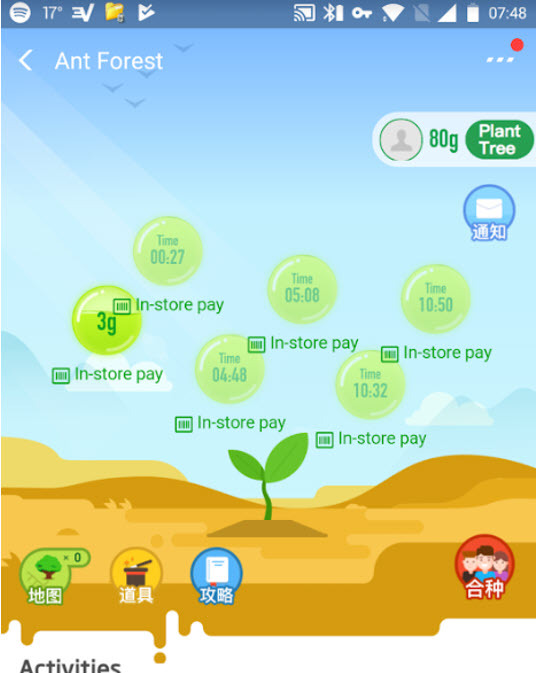 If the tree is fully grown, then Alipay will plant a "real tree" somewhere in China. Of course you can choose the type of tree and the location where you want this physical tree to be planted. A nice gamification element, to motivate me to be a little more sportive and better for the environment. Alipay is not only functional it is also fun to use and it is often these small things like this that give you a good feeling about an app or service. I did not yet lose a lot of weight because of this, but if I do lose 0.5 kilogrammes, I am pretty sure it is because of Alipay, so thank you Alipay. I did not use this function myself yet, but there is also "Ant Services" and it can be so convenient. Maybe sometime you need something from a shop fast but you do not have time to go to this shop, or you need some advice from someone for buying cloths, or you have other mini tasks that you need help with then Ant Service comes in. I think you can compare it a bit to "Amazon's" mechanical turk, but then better and more accesible. Alipay is not a bank, that's the fun part. But Alipay knows really a lot about it's users. Alipay also has a function called "Zhima Credit". Because Alipay knows so much about you they often can give a much better credit score then banks can ever do here in China. 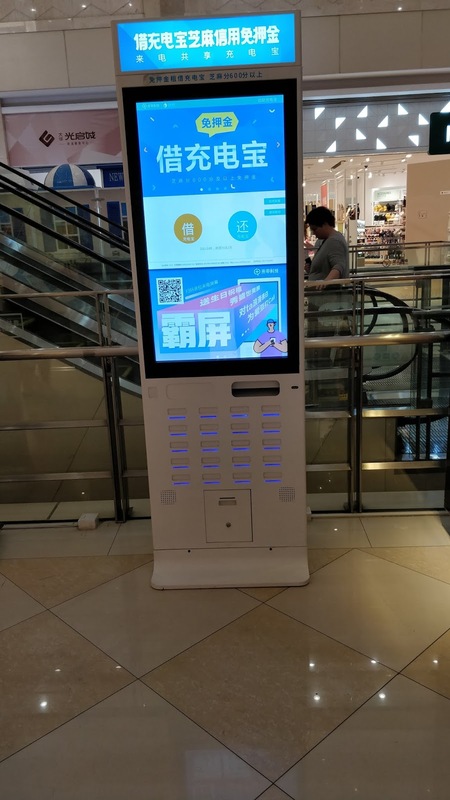 If you have a high zhima score, you can for example rent a "power bank" in a shopping mall (yes there are really vending machines in shopping malls where you can rent a power bank) without paying a deposit. Of course Alipay also has some kind of loyalty programme, but a fun one. It motivates people who always order everything online from their phone to visit physical shops, as you can get bonus loyalty points if you visit physical shops. Promotions for visiting these, often local SME business are being pushed from within the app based at your location. 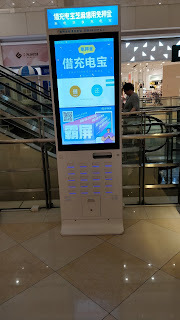 So it is possible to motivate digital natives to visit physical shops. 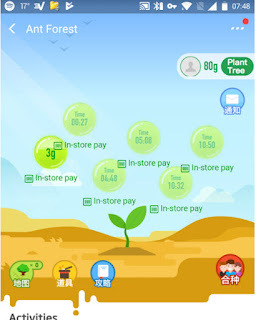 Just make it easy and think from the user's and retailers perspective, like Alipay does. I also have a mobile phone subscribtion here in China. But paying or charging my subscribtion is also so easy. So many ways to do so. Just use the "Top Up"" function in Alipay and within a few seconds you have paid and your phone subscribtion is charged again. But even if you do not want to use Alipay it is also possible to charge directly via wechat pay, or even via the big platforms, like jd.com or tabao.com. Just use Alipay to search a movie theatre near your location based at GPS and with a few clicks you buy your ticket. It's that easy and often (much) cheaper then buying it directly at the theatre. Besides that it is very convenient that it is all in one general app, you do not need a separate APP or website, just use Alipay and order your movie tickets. I still remember the "ov chipcard" transportation card from the Netherlands. If I charged it online, you always still had to go to some strange machine to "collect" your money at your chipcard. So annoying and useless. Here you just charge your transportationcard via for example Alipay and it is charged directly. Besides that, nothing can go wrong when checking in or out, since there are gates everywhere. You have to pass a gate to enter or to checkout. Not as in the Netherlands where you have "poles"where sometimes you have to charge some extra value for some trains, or where you have to check in and check out if you use another train company. Here it is much easier from a user's perspective. Since often interfaces are Chinese only I need collegues and friends to order things for me online. I want to prevent that I buy things that are very different when they are delivered as what I expected to buy. I always transfer the money then immediatly to the collegues and friends. 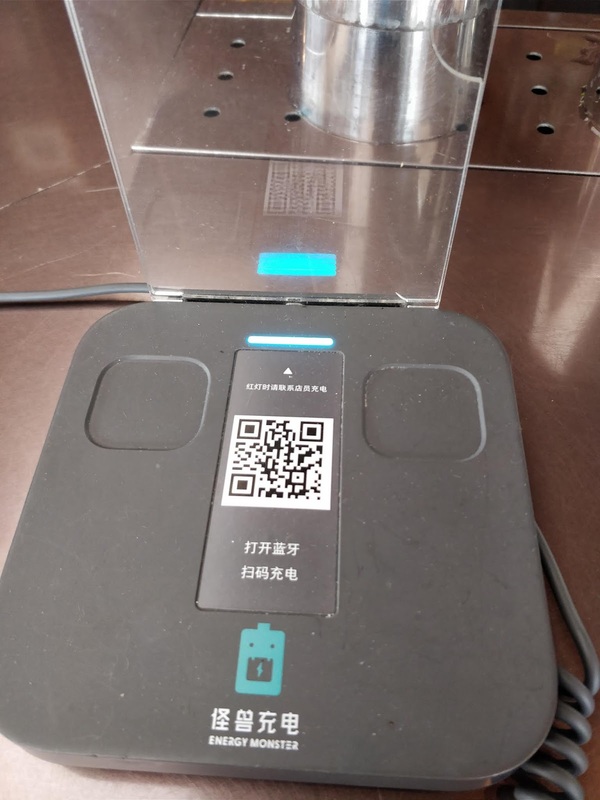 This is so easy via Alipay, no difficult IBAN numbers to remember no risc of transfering money to the wrong person, in Alipay you just have a "friend" section where you can add people by using a QR code. Select the friend, and transfer the amount. Technology here makes live so much easier. I have the feeling that most apps and services are really built from a ''design thinking" perspective as they really work for users. That is Chinese users, because often most parts of apps and services, I do not understand as most is in Chinese. That's also my one point of critic at Alipay and most other apps or services I use, they often have an international version but even this is only partly in English. The journey for international users, can I think easily be improved by adding more translations and sometimes some extra functions for internatial users. With these adjustments they can improve the overall China experience for both expats, businessmen and tourists a like. Transportation here is so easy, cheap and advanced here. The new Chinese build Fuxin train between Shanghai and Beijing is way advanced then something I have ever seen in Europe, not only in term of technology but also in terms of experience and I mean the total experience of boarding, unboarding,just ordering food or coffee from your train seat with your mobile phone and get it also delivered to your seat, the safety, the cleanliness etc. The train from Pudong Airport to Shanghai City center is a Maglev train with speeds up to 430 km per hour, within 8 minutes you are in the city..amazing.. If I want to ride a bike, I can just grab a mobike here at the street. 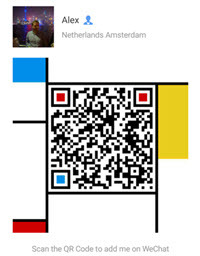 I pay about 10 eurocents and open the lock with my mobile phone by scanning a QR code. The subway? It's cheap, very fast and literally most subways have so many carriages that I think some are more then 500 metres long. Transportation here is fun and it makes you do things more easy then in Europe, and if you do things, you spent money and have fun. Good for all. It is very nice to work here in a different time zone, and to add value for both headquarters and local offices in the world. The future is nice and the world can learn a lot from China at some aspects.